NOW AVAILABLE 199GBP+vat with free uk shipping. UK Payment prefered by direct bank transfer or Debit card. Visa credit card may incure a transaction charge. 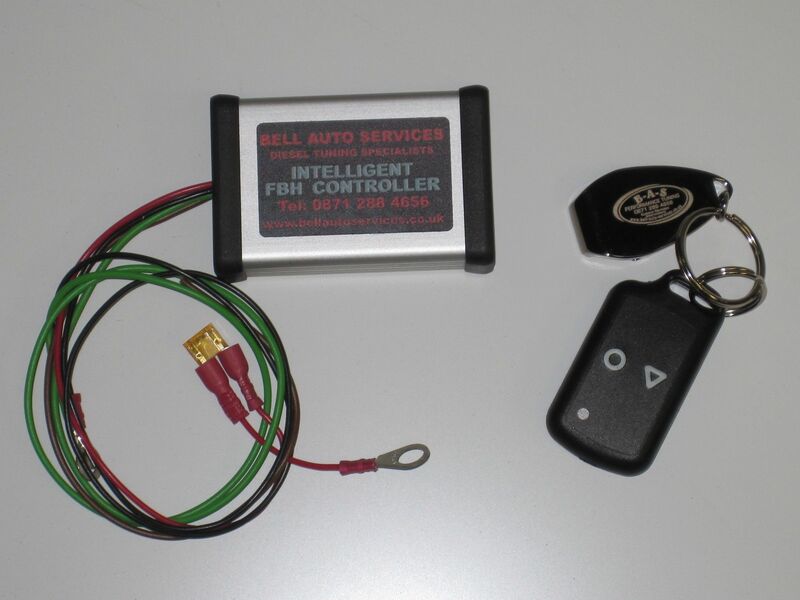 Bell Auto Services is pleased to announce here first the launch of a brand new Fuel Burning Heater Controller, initially for the LR Disco 3 and RRS diesel model pre 2010 cars. Ideal for warming your engine on cold winter mornings while sat in the comfort of your house, removing the need to go outside and start your engine to defrost the car ! BAS has listened to customers requests and produced a product that will start your fuel burning heater without you having to physically start your engine. The intelligent controller works by establishing communication with the FBH and reading its status, voltage, temperature and other details. It then issues the commands needed to start the heater and finally checks that the heater has started correctly. If the heater fails to start then the controller will automatically clear old faults if necessary and attempt to restart a total of 3 times. All versions are able to manually control fuel pump priming process of the heaters diesel pump if needed, which previously meant a visit to the Webasto dealership or your local LandRover dealership if you don�t have access to diagnostic tools yourself. �	Kit1: Basic, 3 wire instal. press button to start, press button to stop, with built in RF controlled two channel hand held �plip� for remote start and stop also allowing capability to add your own GSM box it you wish. �	Features as standard, �start stop� plip, 3 times restart attempt after fail, FBH fuel pump prime via button on box, Fault code blink and clear. �	Kit2: Built in RF as above in Kit1 but with the added functionality of a GSM controller that gives a zero cost �dial to start� option. It also provides you with full integration via text message control for status reports and fault codes on demand. Still in development but can be sold as an upgrade to Kit1. The controller is designed to start the FBH heater independently of the vehicle�s CAN bus system so you can lock and unlock the doors without it stopping the run process, It can also be wired if needed to switch off the heater when the ignition is turned on. We are still working on the function list that Kit 2 will provide and any suggestions are welcome. One idea is to command the unit via text message to heat until a certain water temperature is reached, EG 85 deg C. Our tame programmer likes a challenge so tell us what you want and we will see if it can be implemented! How easy is this to fit please? Now - MY11 RRS Autobiography TDV6, Orkney gray, tints, steps, daylight running lamps and allllll the toys!!! Looks good Pete, I guess it's simpler than the OE timer to install 08 2.7 RRS "S"
The instal is only 3 wires. 12v to the battery. GND to a body GND post and a wire to pin 2 of the fuel burning heater. It's fat simpler to install than the other controllers available. Bought one of these and not being technically confident to fit to a luxury car had great support from Pete at BAS. Tested over the last 2 days and what a difference when getting into a cold car - turn the key and instant warm air! Thanks to Pete and BAS. Now - MY11 RRS Autobiography TDV6, Orkney gray, tints, steps, daylight running lamps and allllll the toys!!! Looks so simple to fit after the Danhag unit I installed last year. What is the maximum burn time with this unit? With kit1 the maximium is 45 mins or 76c which ever comes first. burning any longer than 76c on any module only puts the fbh into idle state where it just keeps the temprature at 76 and does not make it any hotter. Does this device just heat the water in the cabin heater system or will it effectively bring the engine up to temperature (oil in the sump excluded)? The module heats all the water in the cooling system, this is the engine and the internal rediator of which bth gets warmed at the same time. Maximium temprature you can heatupto with the FBH is 76C, after this the fuel burning heater its self goes into idle/hover state to maintain as best it can this temprature. I'm assuming that we have a similar FBH system in the TDV8? Is the installation process as easy as the TDV6 as i've been watching the thread on the disco3 site for a while but was hanging on until kit 2 was available but if it's not imminent i may have to invest sooner. I have a friend who is in the area so can go up in my car to you and pay cash? Thanks Keith Overfinch TDV8 HappyMan! Gone - Austin Allegro, Black, Vanden Plas 1500!! Ok Thanks for that, Keith Overfinch TDV8 HappyMan! Hi Pete, Does this unit switch on the heater fan as well.